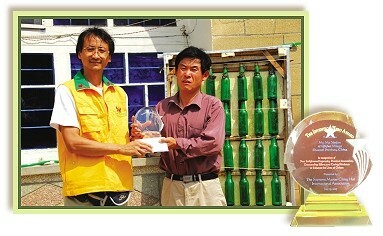 On September 1, Golden Year 4 (2007), representatives from the Supreme Master Ching Hai International Association went to Shaanxi Province in China and presented the "Shining World Invention Award" to Mr. Ma Yanjun. Mr. Ma is a farmer living in Mizhi County, northern Shannxi. He used discarded beer bottles to make a solar-powered water heater. Currently, twenty families in Qiqiao village have started using this invention. "As long as there is sunlight, my heater will heat up in about ten minutes," Mr. Ma said. It took four years to create this special water heater and he calls it the Aquarian Solar Water Heater. 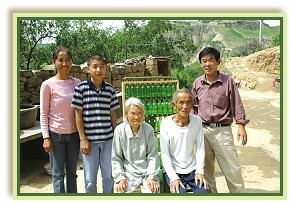 Mr. Ma's mother has been suffering from arthritis since 2003 and needs hot water for bathing. Heating water with straw and wood was not convenient, so he experimented with many other kinds of materials to see if he could make an efficient hot water heater. The results from using black plastic bags and medical intravenous bottles to make the heater were not satisfactory. 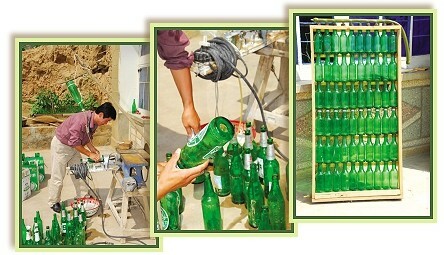 In the end, after many trials and improvements, beer bottles achieved the successful result that he was looking for. Mr. Ma was so happy with his hand-made, low-cost water heater that he started to introduce the system to his neighbors in the village. The water heater is composed of sixty-six beer bottles, grouped in sixes, and only takes one day to assemble. Each day, it can supply hot water for three people. Therefore, it is environmental friendly, energy saving and convenient. Those who have tried this system have been very impressed by its effectiveness. Thus, more and more people are starting to use it. Mr. Ma demonstrated how to assemble and operate the heater and took us to visit the other people in the village who have been using it. Now that Mr. Ma has become more skilled in making the heater, he has even created a special drill for it. He is willing to teach this technique to whoever wants to learn because it saves energy and helps protect the environment. His biggest wish is to share this Aquarian Solar Water Heater freely with those in need both domestically and internationally. 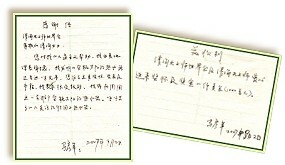 Mr. Ma was very surprised and overjoyed to hear that Supreme Master Ching Hai had awarded him the "Invention Hero Award." Gladly receiving the plaque and the cash award, he said: "I am very grateful for the support and encouragement from Supreme Master Ching Hai and Supreme Master Television. I will further improve the water heater so more people will be able to benefit from it." We congratulated him for receiving this honorable award and hope that he will continue making more wonderful inventions to benefit our earth. Note: The "Aquarian Solar Water Heater" is composed of three parts: The cisterns in the first part can be used twice as a metal container. The second part is recycled beer bottles and the third part includes hoses and connecting tracks. The first step in making the heater is to drill a hole in the bottom of each bottle. After that, attach the hoses and tracks to them. The combination is flexible. It takes eleven groups of six, totaling sixty-six of beer bottles. More bottles can be used depending on the situation.